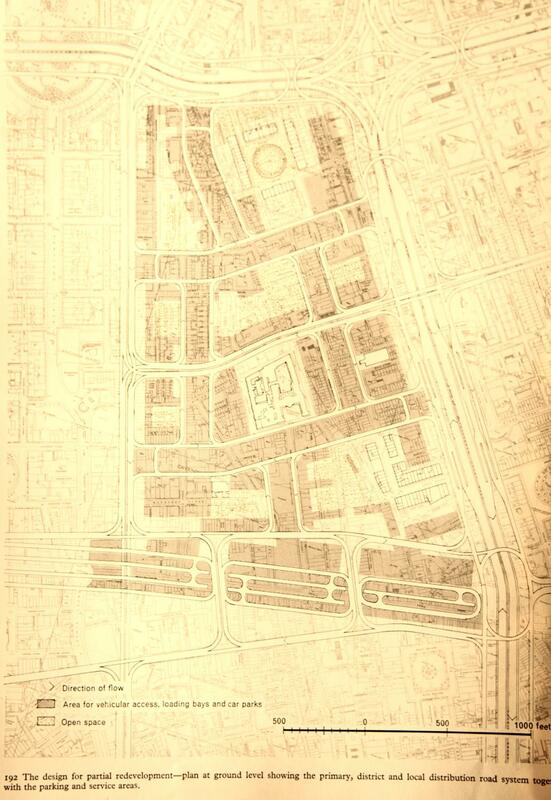 It’s an uncomfortable fact that the railway is already, relatively, a rich man’s toy*. The whole railway. 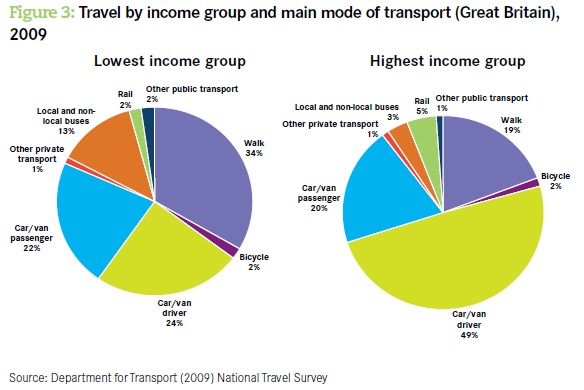 People who use the railway, on average, have significantly higher incomes than the population as a whole. Simple fact. The assumptions underlying the pattern of use of HS2 assume similar pricing to the West Coast Main Line, which ranges from eye-wateringly expensive to really quite reasonable if you dig around and buy in advance. And therefore the assumption that the socio-economic mix of passengers will be broadly similar to those currently using the West Coast Main Line. Nobody is really commenting on the fact that Hammond was not merely saying that people are priced off the railways, but that it doesn’t matter if people are priced off HS2 because they’re already priced off the railways. I would have thought that The News would have wanted to play up the HS2 connection. But people are questioning whether it’s really true that train users are rich. It sounds like a convenient setup for bashing railways and promoting roads: the poor can’t afford to use railways, therefore anybody who wants decent, affordable railways is an enemy of the poor. Spend all the money on more road subsidies investment and fuel tax cuts instead. The railways really are being used by the rich a lot more than by the poor** — about four times as much. 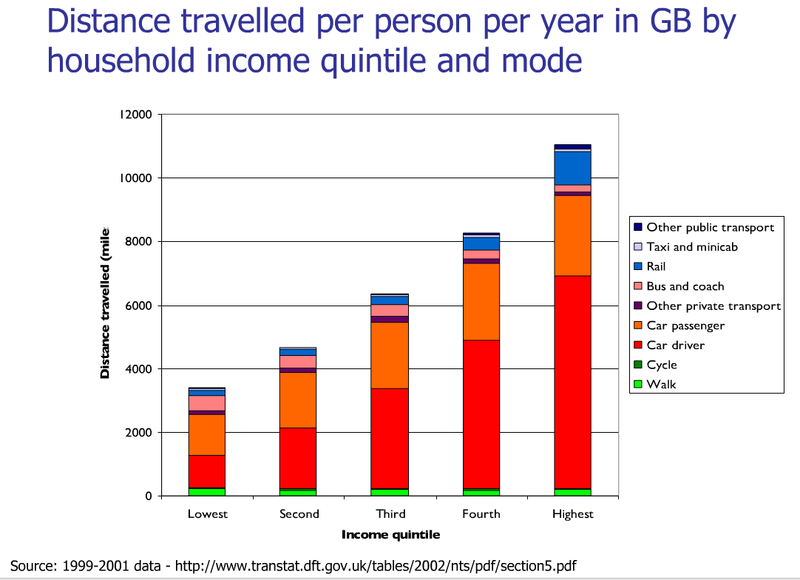 5% of those in the highest income group use rail as their main transport mode, compared to 2% for those in the lowest income group. *** But, wait, there’s another difference between those two groups, isn’t there? It turns out that the motor car is a rich person’s toy too. Poop- poop! Travel is a rich person’s toy, and that makes better employment opportunities and services a rich person’s toy. One of the best ways to overcome that is to invest in local transport, and in local transport that anybody can afford and always will be able to afford; the sort of local transport that will stimulate town centre renewal rather than further drive decline. The bicycle, for example. Of course, Hammond thinks that investment in transport for the rich is good for all of us: the company director who jumps on HS2 for the Channel Tunnel or Heathrow will be employing lots of people at all levels in Manchester or Leeds. Allegedly. 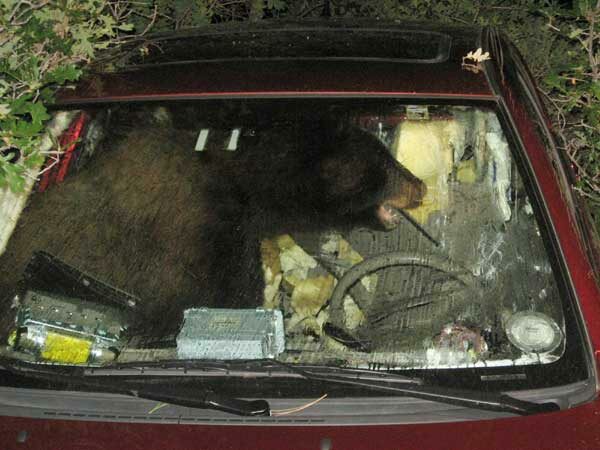 I suspect he’s maybe more likely to be visiting his contractors in the far east, or his accountant in Switzerland. * This was a quote from the question he had been asked by Julie Hilling, in turn a slogan used by the anti-HS2 campaigners. ** Yes, “the railways really are being used by the rich a lot more than by the poor” is subtly different to Hammond’s claim that “people who use the railway, on average, have significantly higher incomes than the population as a whole” — the former is about distance, the latter about users. One rich person doing the length of the UK would, by my metric, have used the railway considerably more than a dozen poor people popping into their town centres. If you can find better data, do share. *** Thanks to Tom for pointing out the mistake in original wording here. Ken Livingstone has picked Val Shawcross as running partner. Val chairs the assembly transport committee and has experience with both the outer and inner boroughs, so from a transport perspective, she’s probably the best person for the job. She wants people to get out of their cars (including Olympics VIPs). It’s worrying, though, that despite commissioning the cycle superhighway survey and stating that she “wants to know what what would get you cycling”, she hasn’t quite acknowledged yet that the result of the survey was a massive call for proper cycle paths. The Scottish Transport Minister, Stewart Stevenson, resigned for his slow response to the snow. By his criteria, Boris would have resigned several times over by now. Truck drivers in Scotland have been allowed to work overtime — because safety rules matter less when it’s icy? Of course, making sure that petrol stations have supplies is more important than preventing overworked truckers driving into a fuel tanker. And according to BBC News, SouthEastern management have made up for all their snow-related customer service failings by, erm, turning up to their long-scheduled recurring meeting with passengers. No resignations (or franchise forfeit) there, yet, then? Absurd innovation of week: yet another device to allow Motorists to pay less attention. South Yorkshire are “trialling” a speed camera switch off. Uh, haven’t we done enough “trials” to know what happens there? And in South Wales, Motorists demonstrate their contempt for the lives of the people who are building roads for them. There are record numbers riding the railways in London — but for how much longer? While it’s hard to give a damn about car parking charge increases when you don’t have a car, it does seem unfortunate that the rising price of station car parking (at the same time as 13% p.a. fares hikes) appears to be making people give up the train rather than the car — one in four say they’re considering switching. 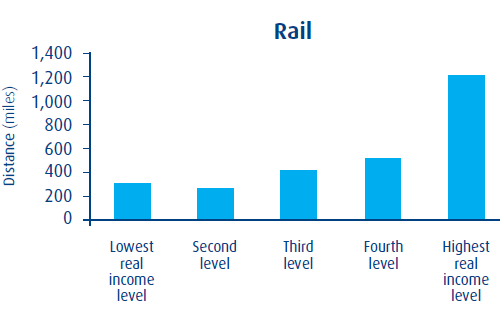 And a government adviser’s report suggests that we can cut overcrowding, by, erm, charging much more to use overcrowded trains. Labour are reconsidering high speed rail, while the Tories are promising to keep those Tory voters along its route happy with fabulous cash payouts. The Campaign for Clean Air in London are threatening to challenge Boris in court over the removal of the Western Extension Congestion Charge Zone. Waste of public money if it goes to court? No news outlet I can find mentions the massive EU penalties for poor air quality (many times the cost of a court case), or the vast numbers (much greater than direct road deaths) of otherwise economically-active people who are disabled and killed by pollution-related diseases. Meanwhile our own Green MEPs are encouraging the EU to reject the mayor’s application for an extension to the deadline for complying with those air quality laws. That runaway Northern Line train was both human error and faulty equipment. The Met are looking at thousands of people’s Oyster records behind their backs. Having cut back on customer services, SouthEastern are looking for more staff savings: look forward to strike action in the new year. Somebody’s stealing the pavements in Camden. “Grannies don’t like being thrown around”: cuts to pensioner bus travel will mean dedicated crap bus services for them. And for some reason not allowing blue badge holders to use the olympic lanes is considered an outrage too far. How will builders get to their jobs now? The RV1 riverside bus has gone hydrogen powered, in order to test the technology. The hydrogen production requires electricity, and the electricity is still mostly generated by burning coal and gas. It might at least reduce the particulate pollution given off by these vehicles (or shift them back to the out-of-town power station, anyway). Here’s an updated tube map for the day London goes under the waves. I don’t often cover news outside of the UK, but: this is just how they drive in China; and this story from NZ made me giggle — they seem surprised that building a new motorway caused congestion. Has NZ learned nothing from the mistakes that Europe made forty years ago? I took the opportunity to pen a few lines on this occasion. None of them getting far. Thanks, Jessica 16 (if that is your real serial number). 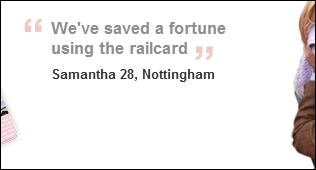 I was having difficulty understanding the concept of the card, which had only been explained in very cryptic terms like “Save 1/3 on fares across Britain”, but then I found your insightful and delightfully minimalistically punctuated testimonial and it made it all so easy to grasp. Meanwhile, if you were thinking of taking your firstborn to market in the hope of raising enough money to pay for a rail fare, why not consider buying a Family & Friends railcard? At a third off, this means you’ll be paying only two fortunes per journey.